A few weeks ago I wrote about my love affair with Evernote, a free application that I use both at work and at home. 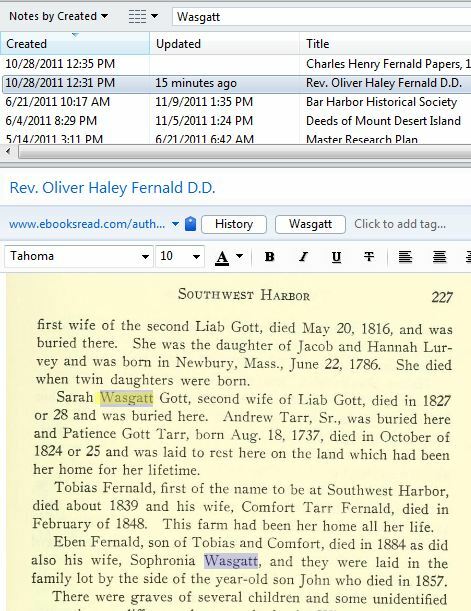 Evernote and Roots Magic, my primary genealogical software, provide my main source of organizing my genealogical research and documents. I love both. Evernote even searches text from images! As much as I love Evernote, yesterday I began to question my organizational system. I’ve started the National Genealogical Society Home Study Course. It’s excellent! Lesson 1 discussed organization and how to manage your research files, and was the impetus for reconsidering my electronic organization. Well, after spending the better part of 24 hours considering this, I’ve decided: EVERNOTE STAYS! NGS has no firm recommendations, but suggests a system that is followed consistently that allows the researcher to easily identify documents and files. Evernote allows me to do this. See the above screenshot, in which I completed a search of my notes that contain the surname, Wasgatt. Evernote even searched the images, which I’d attached after doing a “Screen Snip” (details are in my last Evernote post) of online e-books which I’d saved in Evernote. Flag items for further research or data entry, and save URLs where the info was found. Evernote automatically attaches and saves the URL for any downloaded text, so you can easily refer back to the web site from where data was clipped. (More about clipping below.) 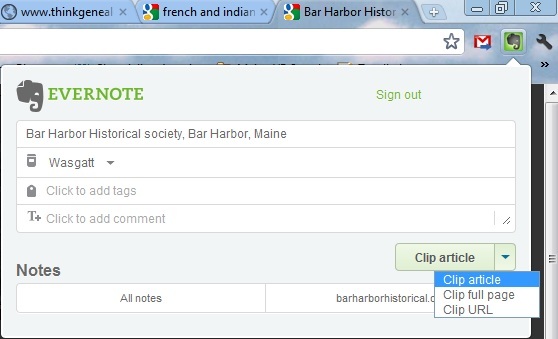 Even more cool, you can add a check box to any note to flag it for further research. I use this feature often when I’m doing online research. Instead of stopping my research at that moment to process whatever data I’ve found, I can add this check box to be sure I come back later to analyze the information and process it, if appropriate. When complete, simply click the check box and the item will no longer show up when searching items requiring follow-up. I’ve been a long-standing Mozilla Firefox user; however, I’ve converted to Google’s Chrome. I made the switch for a variety of reasons, but a large consideration was the Evernote plug-in for Chrome is far superior (IMHO) over the clip tool for Firefox. When saving database from a web page into Evernote, you have several options – select text and save that as an “article”, clip the entire page, or just clip the URL. Chrome’s plug in for Evernote also allows you to select the Evernote notebook in which you wish to save the data, as well as select any tags you’d like associated with the information. 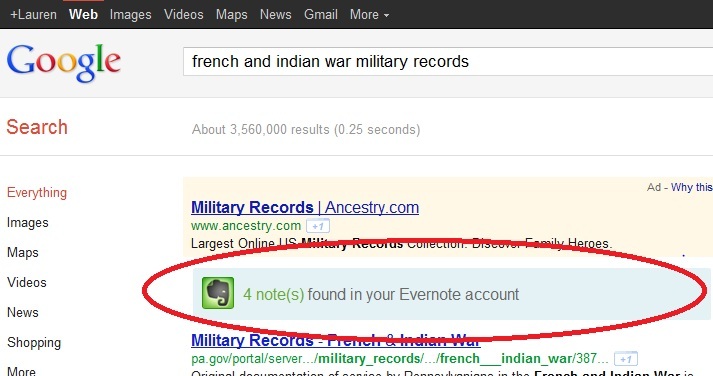 Another cool feature available to Chrome users is the ability to allow Google to search your Evernote files. (Not to worry, only YOU will be able to search – your files will remain private and unavailable to others.) This is really handy when I’m looking for new information, but may have forgotten what data I’ve already uncovered in previous searches. NGS has given me definite food for thought in how I organize my files. Using Evernote, I can find data through various tags. For example, I can search for all notes pertaining to the Stanwood surname that involve deeds. Alternately, if I’ve located a document which is applicable to two family lines, I can tag it with both surnames. (Bradstreet AND Stanwood, for example…it will then appear in searches for either surname.) This eliminates the need to have a copy of the same document in two separate folders. What I will be doing differently, is more carefully tagging my notes in Evernote. In addition, I will begin to document in the note where on my hard drive I’ve saved the electronic version of the document. Great suggestions from the home study course! 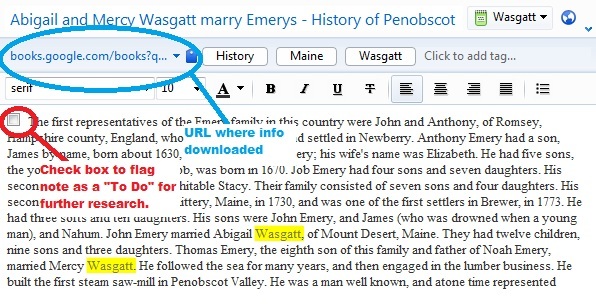 Between Evernote and NGS, I hope to become a much better genealogist. Now, time to go photograph my paper copies of deeds and probate records received by old-fashioned snail mail from various county court houses last week…and link in Evernote and Roots Magic, of course! This entry was posted on Sunday, November 20th, 2011 at 12:10 PM	and posted in Learning, Technology. You can follow any responses to this entry through the RSS 2.0 feed. You are very welcome. Quick tip – you do have to go into settings to allow Google to search your Evernote files…if you are logged into your Google account, and have installed the Evernote clipper plug-in, then I believe it gives you a prompt to change your settings if you’d like to search your Evernote files. Happy Hunting! Lauren, Today was my lucky day when I found your Blog. I was at Rootstech too and disappointed to not hear more really excited, concrete use of Evernote by genealogists. You are so on target with your workflow, I haven’t known exactly how to do it myself, but I am sure able to recognize it when I see it. THANK you so very much for sharing. I have been at the edge of using my trusty Fujitsu scanner to digitize much of my previous genealogy FINDS, and now I have a better idea of how to use Evernote to store and retrieve those precious documents. My goal at this point in life is to be able to put my hands on anything in my digital archives in 5 minutes so that I will also be able to give easy instructions to my grown kids should this Mom not be able to do the digging through drawers and boxes of paper herself. I sort of look on this work as my gift to my family in the future. Thanks, Mary. Glad the post was helpful for you.